Well, back from vacation and I wish I could say well rested, but actually, it was an exhausting and busy holiday time. 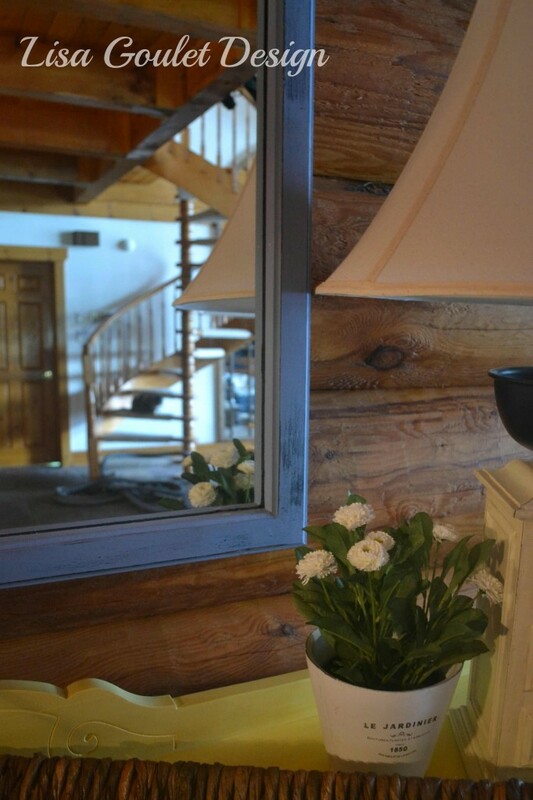 Hubby, with me as apprentice, finished off the sand blasting of the exterior logs on our country house, painters are coming next week to do all the staining…can you say Hallelujah! Then there was the installation of glass railing on the river side of the deck, with some help from our eldest (the reveal on that will be posted shortly), then we finished off the final trim work done and touched up some of the paint in the bathroom, some repair work on our boat, and desperately filling in any holes we found where bats are getting in, yes…I said bats…EWWW not fun 🙁 (I’m still looking up all the time, even now that I’m back home). And last but not least, playing host and hostess to the odd 25 or so guests that visited over the last two weeks. Well, with all this, I still managed somehow to get the buffet/entry console painted, that I had planned to do. I used the remainder of the homemade chalk paint that I used for the matching hutch that I posted about here (this is also where you can find the homemade chalk paint recipe). I was so hoping that I wouldn’t have to do six coats as I did on the hutch, so I sanded the buffet down somewhat to help with that. Unfortunately, I still needed to do five coats so not as successful as I thought. Here’s what I started with. As you can see I use the buffet as a entry console. It’s great for picking up all the odds and sods that make their way into the house. It also houses all the board games that come out when life slows down a little. And here it is after a few coats. I won’t bore you with the details, as I did the same procedure as I did with the hutch. I love how it pops against the logs and how the details show up so much better now. Any sharp eyed readers notice that I also painted the mirror? 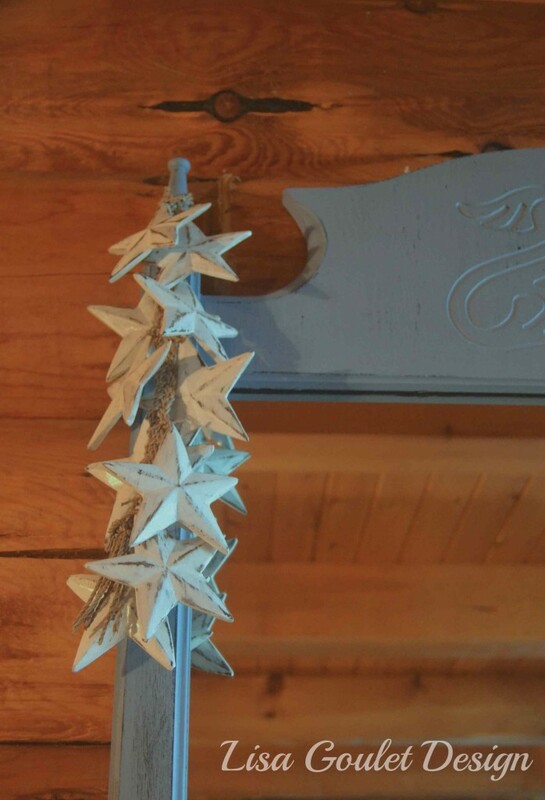 Hubby requested it be blue and I happened to have a can of blue paint there and used it to make up some chalk paint. 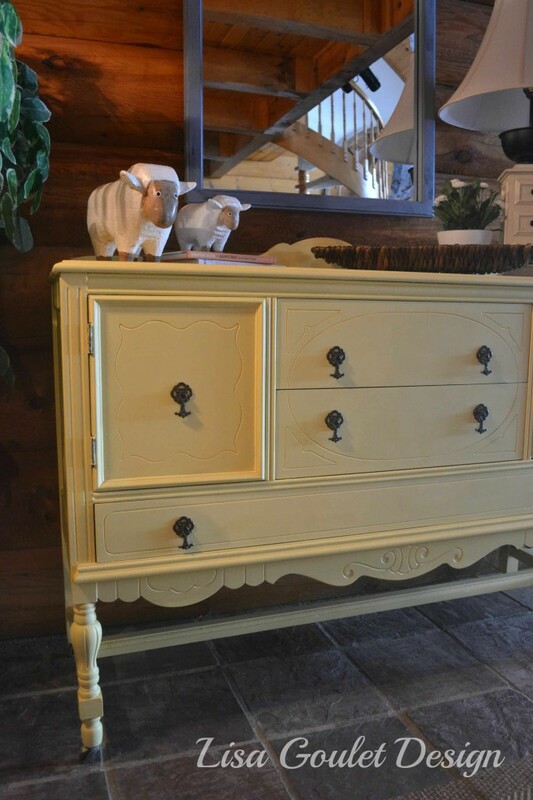 Contrary to the buffet and hutch, it covered easily in two coats and then I sanded down some of the finish so that it was a little distressed, and then applied a light coat of antique wax and then the clear wax over top. I think I may distress it a little more so that more of the black paint underneath shows up better. 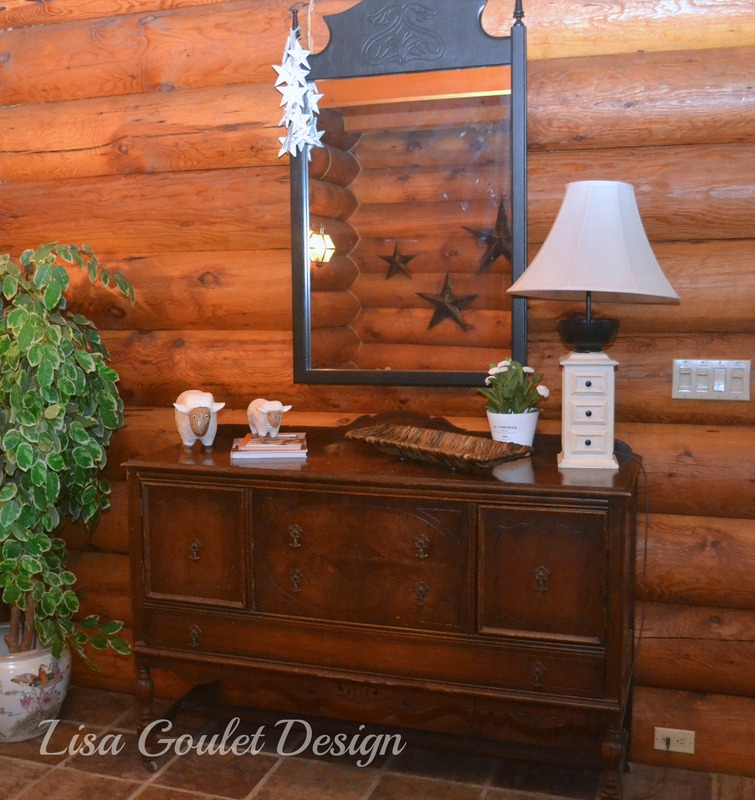 I love that colour you chose for the buffet, it pops so nicely against those gorgeous logs!! And the first thing I noticed was the mirror!! 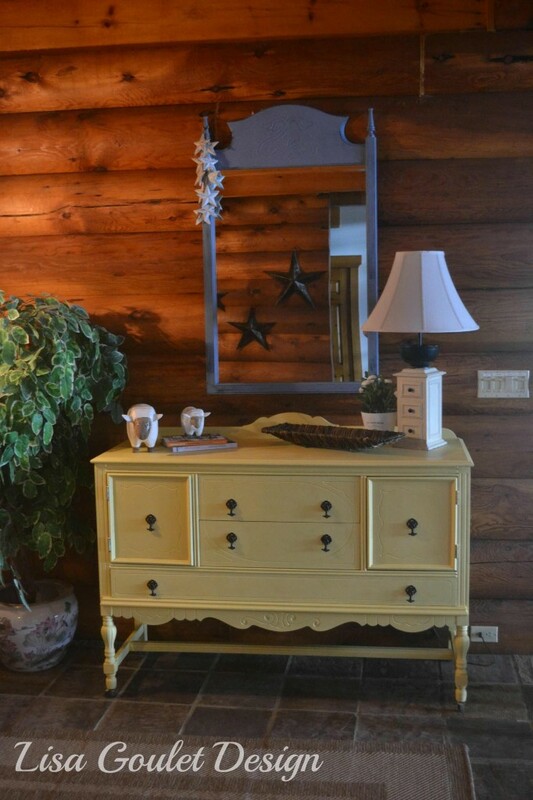 It blends nicely with the yellow on the buffet!! Really in love with your country house!! Hi Lisa. I loved your post, the console peiee looks just perfect. 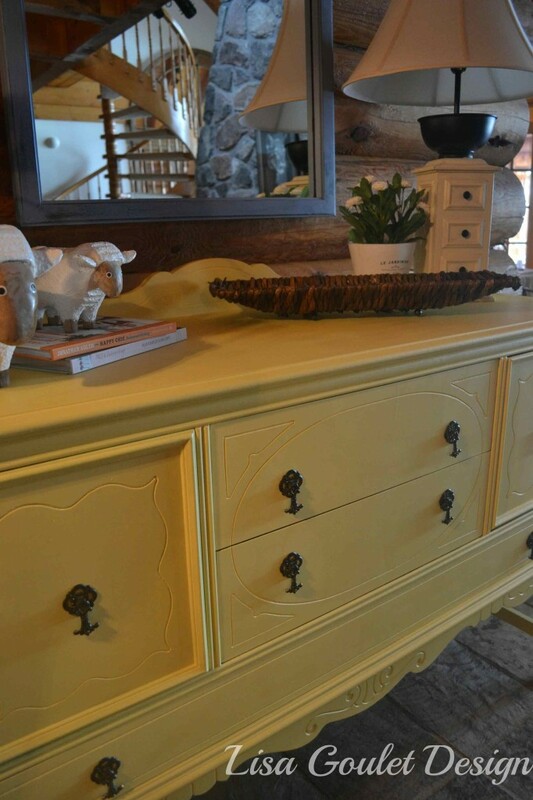 Don’t you just love chalk paint? And you made your own…nice. It’s such a lovely colour, yellow is one of my favourites. It’s a beautiful ‘pop’ of colour, a wonderful greeting as you come in. My kitchen is painted a similar yellow, so cheery in the morning especially. Nice job. Hi Sheila, You know yellow is not one of my favourite colours, but as I like to say, there is a colour for everywhere. When I thought about painting these pieces, yellow kept popping into my head so I went with it and I LOVE them now. It is such a refreshing change from the dark brown. Cheers! Wow Lisa this looks beautiful! What a difference in the detail – and the hardware really pops too. Sounds like you came home for a rest :). Thanks Karen. Have a great Wednesday! Love how it pops against the stained wall. Really freshens it up! It certainly shows up now, gives it some presence in the entry. Thanks for stopping by Shauna. So beautiful! What a welcoming entry! That’s so sweet of you to say Dani, that is my goal to make sure the entry is welcoming and casual. Cheers! Very nice! I love chalk paint, it’s so forgiving. Thanks Randa. 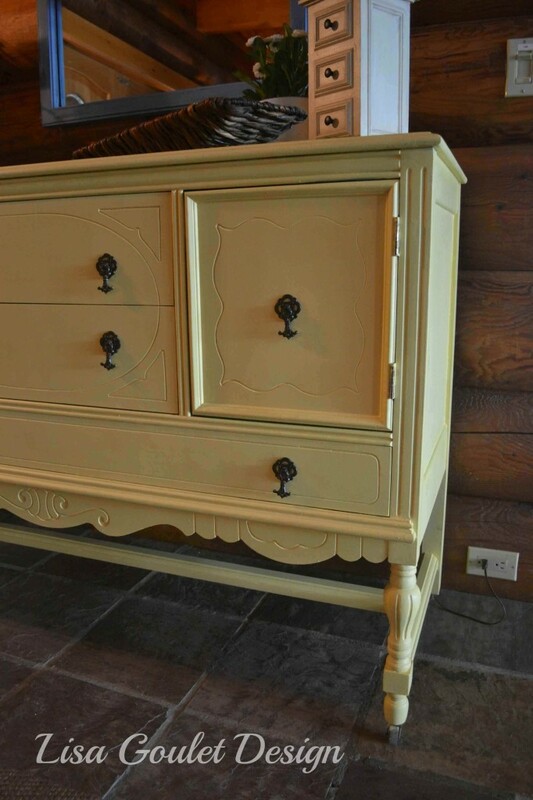 Me too, chalk paint is so forgiving and soft looking. Lisa, those sheep are awesome. Where did ewe get your pair? Ha Ha Meredith. They were a gift from my daughter, from a market we have here in the Ottawa area in the fall, called Third World Bazaar. They travel the world and bring treasures back from all over. Very interesting stuff! Looks amazing Lisa! Really love the yellow you chose. It’s a lovely yellow, perfect for the right touch of sunny I wanted in the space. Thanks for stopping by Vanessa. Have a great weekend! You’ve been busy! 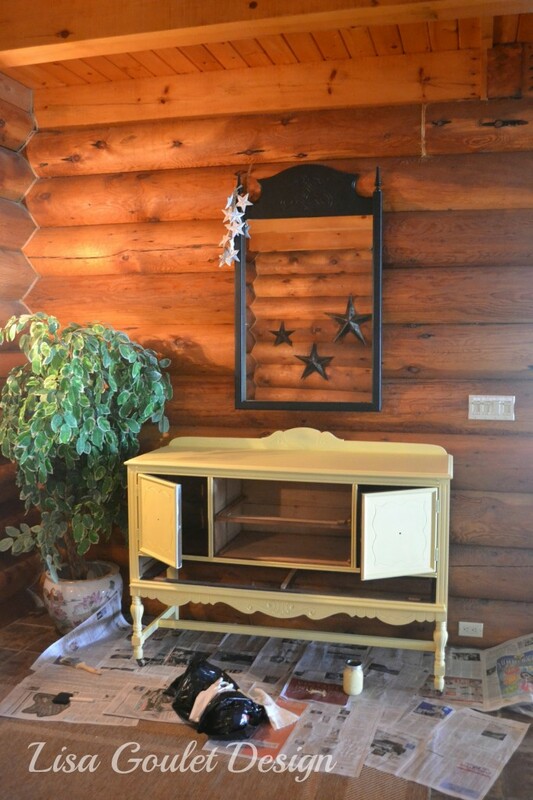 That hutch looks great, what a beautiful colour!! Yes very busy Heather but it’s all good. Things are getting crossed off the list. Thanks for stopping by. Me either Tia…yuck! I’m definitely loving the fresh new look! 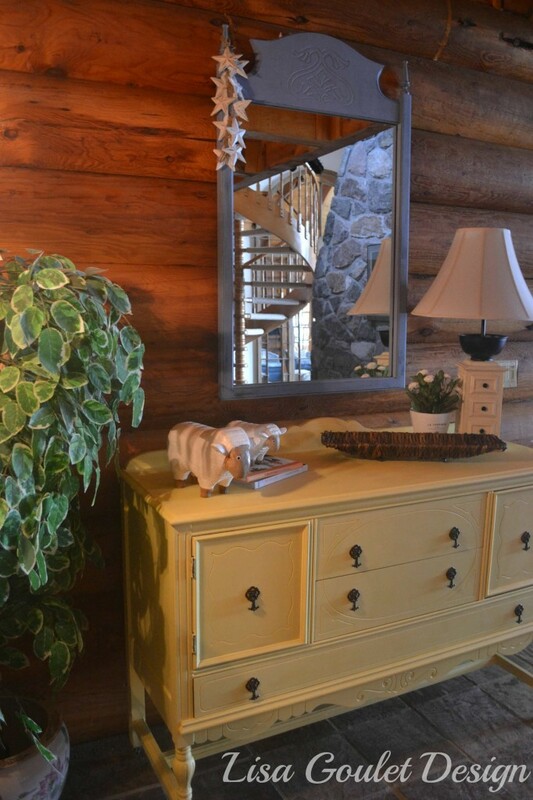 Love the makeover – the colours are pretty, I adore those sheep and that star tree, too! My little sheep are getting lots of love and I do love a star, especially in cottages.